PRICE IS BY PIECE. 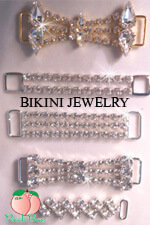 *ADD ON AS MANY AS YOU LIKE OR ORDER SEPARATELY FOR YOUR SWIMWEAR AT HOME. CONNECTORS ARE NOT RETURNABLE IF PURCHASED ALONE.